Pluto's small moons are starting to come out into the light. The most jaw-dropping photos captured by NASA's New Horizons spacecraft during its historic July flyby of Pluto depict the dwarf planet or its largest moon, Charon. But New Horizons also imaged Pluto's four small satellites — Styx, Kerberos, Nix and Hydra — all of which are less than 30 miles (50 kilometers) wide. And early analyses suggest that these moons are plenty interesting in their own right. 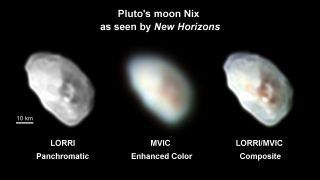 Pluto’s moon Nix, as viewed at three different times by NASA’s New Horizons spacecraft during its July 2015 flyby. "Nix isn't very large, and there is a very fine line between an impact that will make a crater that big and one that will break Nix apart," New Horizons team member Simon Porter, of the Southwest Research Institute in Boulder, Colorado, wrote in a blog post last week. "So, either Nix was very lucky in surviving that collision, or it's a fragment of an older moon that was somehow destroyed." Furthermore, the crater is much redder than the rest of Nix. "Craters excavate material from below and throw it on the surface. This tells us that under its white surface, Nix is probably made of much darker material," Porter wrote. "We don't actually know what either the dark or the light material is, nor will we be able to tell until we download the Nix data from the Ralph-Linear Etalon Imaging Spectral Array (LEISA) composition mapping spectrometer" aboard New Horizons. New Horizons sent home a small portion of its data shortly after the July 14 flyby, but the probe stored the vast majority on board for later transmission. That data dump began in earnest last month, and it should be complete by the end of 2016, mission team members have said. Images of Hydra also reveal intriguing details. For example, the moon has a "rubber ducky" shape similar to that of Comet 67P/Churyumov–Gerasimenko, which Europe's Rosetta mission has been orbiting since August 2014. Pluto’s moon Hydra, as seen by NASA’s New Horizons spacecraft on July 14, 2015. Scientists think Comet 67P may have formed from the merger of two separate bodies, and the same phenomenon may be responsible for the shape of Hydra, Porter wrote. Photos focusing on Styx and Kerberos haven't been received at mission control yet, he added. Pluto was discovered in 1930, and Charon — which is about half as wide as the dwarf planet — was first spotted in 1978. Nix and Hydra eluded detection until 2005, while Kerberos and Styx weren't detected until 2011 and 2012, respectively.